The inaugural Women Pharmacist Day was commemorated on Oct. 12, 2018, in conjunction with National Pharmacist Month, to recognize the important contributions women pharmacists make, every day, to delivering quality care to patients. While women made up only 8% of all US pharmacists as recently as the 1960s, women currently comprise 55% of the pharmacist workforce, and the number of those practicing is on the rise. Approximately 61% of the 14,000 PharmDs earned in the US in 2016 were earned by women, according to a recent press release from Cardinal Health, Women Pharmacist Day sponsor. Women Pharmacist Day was founded by Dr. Suzanne Soliman, a pharmacist who is also founder of PharmacistMomsGroup.com, a not-for-profit organization that offers support, resources and a professional network for pharmacist moms. The group has grown in just one year to over 16,000 pharmacist moms and continues to grow daily. Soliman chose October because it marks National Pharmacist Month; she chose the 12th day of the month to honor the legendary first female pharmacist in the U.S., Elizabeth Gooking Greenleaf, who had 12 children and is an inspiring role model for thousands of women who dream of becoming a pharmacist. 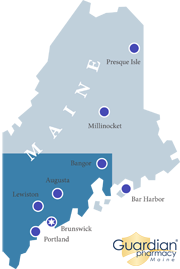 Guardian Pharmacy of Maine is proud and inspired by our 8 female Pharmacists. Pictured are left to right: Amy E., PharmD, Director of Pharmacy Operations, Cathy Y., PharmD, Denise G., RPh, Krista F., PharmD, Shingayi M., PharmD and Courtney Oland, RPh, President. Not pictured are Brianna O., PharmD and Ruby J., PharmD.